Tayla Henry has always been frugal when spending on groceries, but she had never faced an empty cupboard. That changed this past year when the father of her children moved out of the apartment they shared. They had lived together – and shared expenses – for nearly nine years. Faced with a new financial reality, Tayla started to visit the Emergency Food Pantry in Fargo. 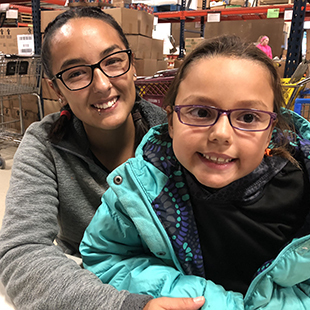 Tayla was confident that groceries from the food pantry would get her and her two daughters, Shakayla, 7, and Valentina, 4, through another week. Tayla works as a personal care assistant to adults and children who have disabilities. She likes the work because it’s flexible. In the evenings or on non-school days, she can bring her daughters with her. The flexibility reduces Tayla’s need for child care, another expense, but the work doesn’t pay as much as the family needs. “For the first time, I have to pay rent on my own,” Tayla says. Before her children’s father had moved out, Tayla had planned to go back to school. Now that dream has been pushed aside as she figures out how to support herself and her daughters. The family are eligible for some food assistance. They receive $80 per month in SNAP benefits, also known as food stamps. Her youngest daughter, Valentina, also receives benefits through WIC, a nutrition program for women, infants and children. Through this program, Tayla is able to purchase milk, eggs, cereal, fruits and vegetables. However, the WIC benefits will end when Valentina turns 5 in a few months. “Then it will be a real struggle (to feed my family),” says Tayla, who lives in Moorhead, Minnesota. The first month-and-a-half on her own was tough. She struggled both financially and emotionally as she adjusted to less income and the loss of a long-term relationship. Tayla’s thankful that she has always believed in a budget. She has a habit of saving money for the things she and her daughters need. Now she budgets for things like ramen noodles and generic-brand cereal. It’s the only reason she’s been able to keep their housing and other needs covered as they adjust to new financial realities.